Fatal Flaw in "Death of a Salesman" by Arthur Miller: What is Willy Lowman's Fatal Flaw? It is in Greek tragedy that we find the story of the tragic hero with what Aristotle calls a hamartia or fatal flaw that prevents him from achieving his goals. According to Aristotle, a play must have four elements to be a tragedy. It needs a character of nobility, this character must recognize the fatal flaw in the climax of the play, high language and the ability to evoke pity and fear from the audience and then soothe it. The question is whether Death of a Salesman is considered a tragedy. What was Willy’s fatal flaw? 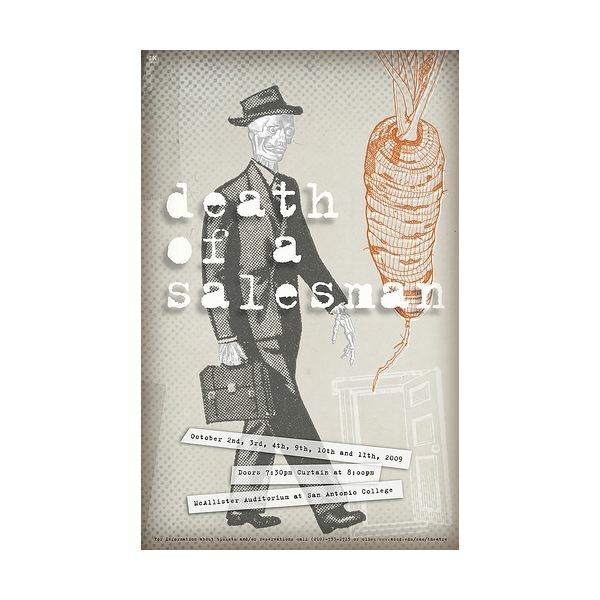 Is Death of a Salesman a Tragedy? Since its release in 1949, critics have debated whether Miller’s play qualifies as a tragedy. Most came to the conclusion that because there was no nobility in the protagonist (Willy Loman) that the play could not be considered a tragedy. There was no arguing that the Willy was flawed, in fact in some cases he was considered too flawed to be a character that could have pity felt for him. Miller answered these critics in his essay Tragedy and the Common Man, where he proposed that tragedy is not the sole property of the noble class and now that the perception that tragedy is somehow above the common man is false. His naming of Willy Loman (Low man) explicitly places him in the working class. Willy Loman is the everyman, the person striving for the American dream (a dream that he misunderstands even at the end of his life). What is Willy Loman’s Fatal Flaw? If we believe Miller, Willy Loman is a tragic hero and thus has a fatal flaw. What is this flaw? That is actually a much tougher question than it might seem. Willy has several flaws to choose from but they all boil down to a fundamental flaw in his thinking. He is always preoccupied with his own dreams and desires, so much so that he denies and ignores anything contrary to his beliefs. Willy believes that the measure of a man’s success is how much wealth he has accumulated and that this wealth is gained by being well liked. He is convinced that popularity is enough to lead to success and this eventually leads to his fall. When Willy decides on committing suicide by deliberately getting into an auto accident this doesn’t feel like a character recognizing his fatal flaw but once we understand the reason that he does it then there is a bit of closure. Miller said, “I think the tragic feeling is evoked in us when we are in the presence of a character who is ready to lay down his life, if need be, to secure one thing–his sense of personal dignity." This is the reason that Willy Loman is a tragic hero. He realizes that his life is one failure after another and that he never amounted to what he thought he should be. In this final act, he could get the insurance company to pay $20,000 to his sons so that they could pursue their dreams. Although he does this to secure his dignity, it is never revealed if he did this as a last act of selfishness or if it was truly his belief that this was the one good thing he could do for his sons. If we believe that he believes this is his one winning deal and that he doesn’t realize that his ambitions were based on fallacy, then he has shown this to be his fatal flaw. What about the American Dream? The reason that this play is still relevant today is that it spotlights one of the greatest misconceptions that has arisen about achieving the American Dream, a misconception that is flaunted on television and in movies every day. The belief that the superficial qualities of attractiveness and likeability are the keystones to success. This is far from the truth, but the media pushes these two values on us daily. While Willy is completely convinced of this, his son Biff has come to value a more rewarding understanding that rewards hard work without complaint. His success is evident in his workings on the farm and his want to move out west and buy a ranch (a dream that can be realized with the insurance money from his father’s suicide). The fatal flaw in “Death of a Salesman" is the same fatal flaw shared by thousands of individuals coveting the American Dream and this convention is on the rise. Our media pushes the same fallacy that Willy Loman would finally succumb to. Perhaps this should be one of the major works of literature that all of our children should be required to read and watch. Arthur Miller, “Death of a Salesman," The Viking Press, 1949. Arthur Miller, "Tragedy and the Common Man," from The Theater Essays of Arthur Miller (Viking Press, 1978) pp. 3-7. 1949.